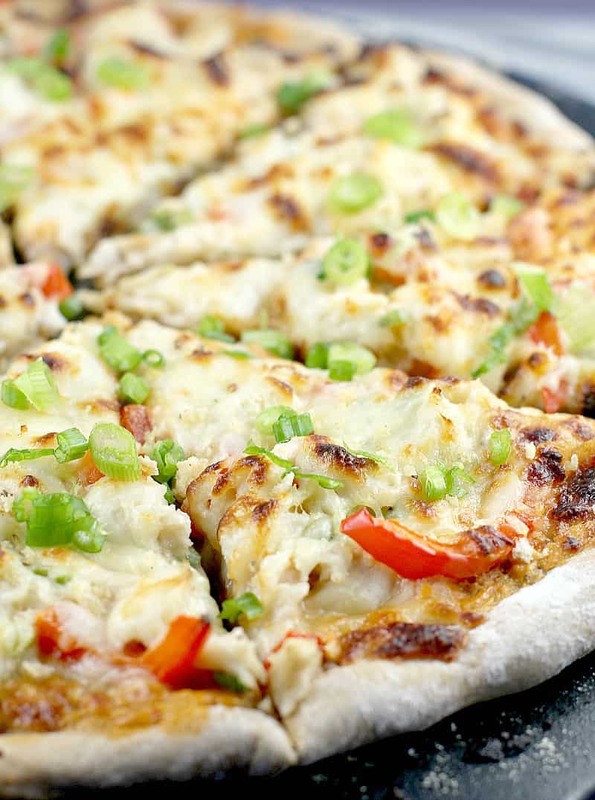 Succulent crab and creamy sauce are just the beginning of this epic delicious pizza. 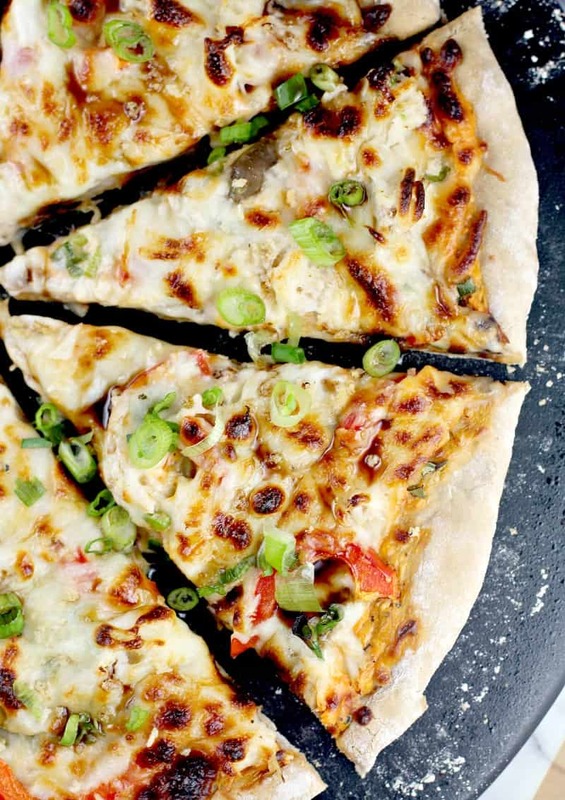 Jazz up pizza night with this creative Crab Rangoon Pizza! This recipe even comes with a sweet and salty drizzle. I LOVE ME SOME PIZZA. Let me just get that out there firstly. And I cannot believe it has been soooo long since I have made up a new pizza recipe. I mean, my French Onion Pizza? My Cuban Pizza? My EPIC Monte Cristo Pizza??? Pizza is my THING, so apologies. Apologies that I have gone this long (seriously, it’s been since 2016), but I am pretty sure this Crab Rangoon Pizza makes up for it. This recipe is really straight forward and easy to assemble. I used my basic prepared Sam Adams Beer Pizza Dough, but you can use whatever pizza dough you like or even just pick some up at the bakery of your grocery store. The I mixed together pizza sauce and cream cheese, which yeah I admit is kinda the obvious thing to do for a Crab Rangoon Pizza. Then we used a couple great toppings: crab, red bell pepper, mushroom, and green onion. Then of course CHEESE. Then crunchy topping, because this is the pizza version of a Chinese appetizer after all. Then we finish our glorious pizza with an extra special touch …a little drizzle of sweet-salt that deliciously makes your brain go “HuMMMM”. So, that’s it folks. 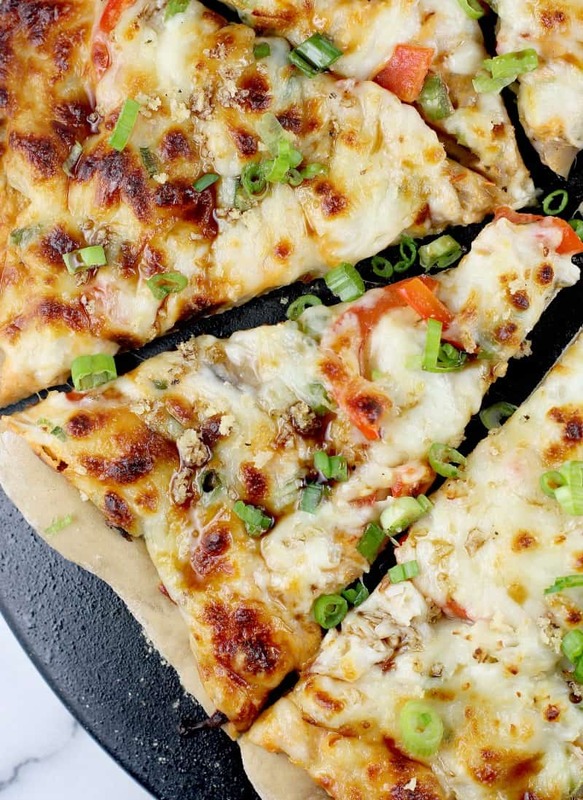 A yummy new, creative Crab Rangoon Pizza and OH SO good. PIN to save, give it a try, and enjoy. Heat oven to 450F with a pizza stone in the oven. Heat an additional 15 minutes to ensure stone is thoroughly heated. In a bowl, combine the pizza sauce and cream cheese until smooth. In a small bowl, combine the panko breadcrumbs and olive oil. In a small bowl, combine the soy sauce and balsamic syrup. Roll out the dough. Transfer to the heated pizza stone. 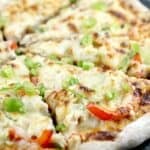 Top with the pizza toppings: crab, bell pepper, mushrooms, green onion, and cheese. Sprinkle the panko breadcrumbs over top. Bake at 450F for 15 minutes or until cheese is melty and crust is done. 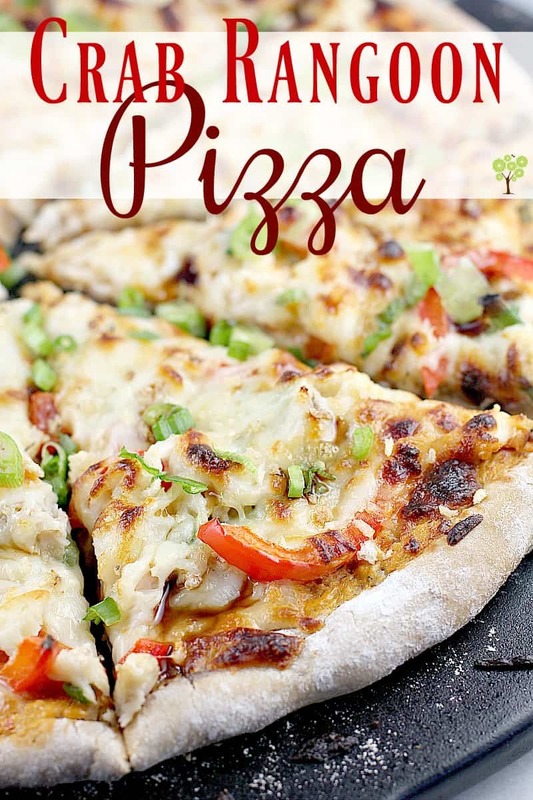 Serve pizza garnished with additional green onion and drizzled with the soy sauce-balsamic sauce. Yields: 1 large pizza.